It was really nice and hot recently, but obviously for the weekend the weather's turned horrible. But we're definitely not getting bored! 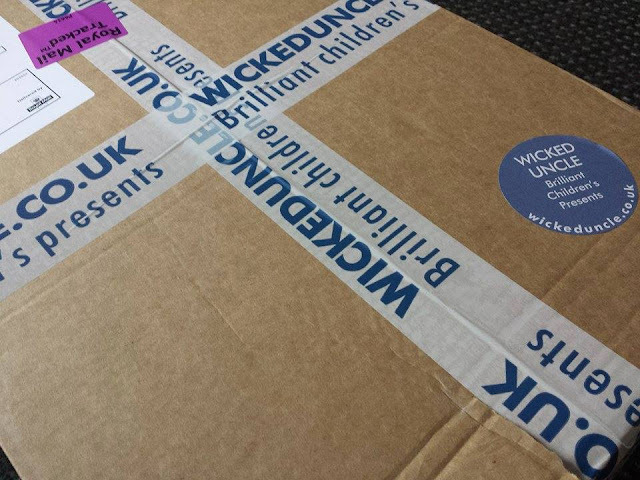 I've recently been invited to review the Wicked Uncle online toy shop. They aim to provide an easy gift service for birthdays and all sort of occasions, not only for parents but for aunts, uncles, grandparents, godparents etc. Basically they want to help you buy gifts for other people's children. Well, we didn't have anyone to buy gifts for recently, so with Adam's 2nd birthday approaching, I decided to get him an early treat. The brilliant thing about the Wicked Uncle website is that it's dead easy to use. First of all, the toys are divided by gender (although some toys are quite universal, and you can find them in both sections), and then we can choose the age of the child we're buying for. The age division is brilliant - I might know what to buy for my toddler, or a newborn, but always struggle to work out what older kids might like. On the website we get the selection from a newborn up to the teens - you can get all the kids in the family sorted in one place! It was really hard for me to choose something for Adam - the selection is great, I couldn't make my mind up! I finally decided to get John Deere dump truck and tractor set, and a Blue Dino from Happy Hopperz. The trucks were an instant hit - Adam is currently crazy about any kind of cars, trucks, and buses. He already owns a larger John Deere dump truck (1st birthday gift from his Granddad) which he loves, so I thought a couple of smaller ones would be great. The Happy Hopperz Blue Dino is really cool too :) It comes with the pump, which is great - but I must admit it was quite a bit of workout to pump the dino! But after quite some time it doesn't seem to be losing any air, so I'm happy with that. I have received the Happy Hopperz Blue Dino and John Deere truck set free of charge, courtesy of the Wicked Uncle toys. I have been asked to provide a review, but my views and opinions are as always my own. Sounds a good site- I'm v against gender using toys but if they are duplicating them it's not so bad- but why not just scrap the separation completely? My little boy would love the diggers, we did have one of the bounce toys but was not a huge fan. I love the name of this shop! It looks great as buying for other people's children can be so hard. This sounds like a good web site to pick presents for busy parents. We love our Happy Hopperz! I'll have to check out Wicked Uncle, I've seen some great reviews. I love the things you chose, My Little Man would love the tractors but he's probably too big for a Happy Hopper now.